Incorporated in 1768 and named for the wife of King George III, Charlotte has constantly redeveloped itself, growing into the largest city in North Carolina. The Queen City, as she is nicknamed, has gone from being an agrarian township to a gold town, textile center to a national banking giant. Presently, Charlotte is the second largest banking center in the United States of America behind New York City. Visitors to the city are treated to historical attractions as well as a varied and vast range of events and recreational activities. Charlotte is ideally located to take in the wonders of North Carolina, as it is only a three-hour drive from the Atlantic beaches and only two hours from the Blue Ridge Mountains. We enjoy four seasons, which lends to fabulous outdoor activities. The Charlotte skyline boasts breathtaking skyscrapers, most famously the Hearst Tower, housing Hearst Publishing, and Bank of America Plaza building which is one of the tallest buildings in North Carolina. ORIENTATION: Charlotte is located in the Piedmont region (a plateau that lies between the coastal plains and the Appalachian Mountains) of North Carolina, along the state's southern border with South Carolina. 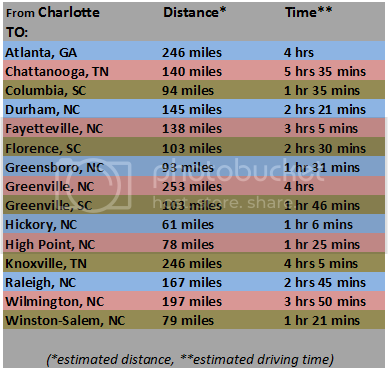 Columbia, SC, is just 94 miles south of Charlotte. The triangle cities of Winston-Salem, High Point and Greensboro, NC are approximately 85 miles north of the city. HISTORY: From 1768 - 1900, pioneers from Philadelphia settled east of the Catawba River and, by 1768, the township of Charlotte was incorporated and the population slowly grew. The town, Charlotte, and the county, Mecklenburg, were named for the wife of King George III. By 1775, the love and respect that had led to naming the area after the King's wife had dissolved. Due to a series of tax acts and King George's revocation of many rights which had previously been granted to the colonists, the people of Charlotte pushed for independence. On May 20, 1775, the Committee of Mecklenburg met in Charlotte, allegedly penning the Mecklenburg Declaration of Independence (also known as the Meck Dec). This declaration was created to break the British rule and preceded the Declaration of Independence by over a year. From 1799, until the California Gold Rush in the mid-1800s, gold fever gripped prospectors in Charlotte after a 17-pound gold nugget was discovered. By 1837, the city was such an important financial center that the United States Mint established a branch in the city. For almost 50 years, Charlotte was the center of gold production in the United States. During the Civil War years, Charlotte was spared from battle but, contributed by making uniforms and ordnance for the war effort. Following the Civil War, the next wave of prosperity for Charlotte came from the partnership of the cotton and transportation industries. The cotton produced in North Carolina was shipped to the rest of the world via steam railway. Charlotte again, prospered as a major rail center between Atlanta, Georgia, and Richmond, Virginia. The growth brought diversity with a variety of companies established business here. By 1880, textile mills began to thrive, allowing raw cotton to be refined locally instead of being shipped to factories in the north. By 1891, such improvements as the electric trolley system and hydro-electric power advanced Charlotte's suburbs. 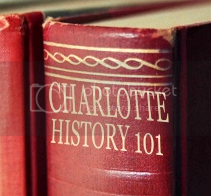 Stay tuned for more Charlotte NC history! You can find a wealth of Charlotte information at www.SOLDbyDebe.com or give us a call for a Charlotte NC welcome pack to be sent directly to you! 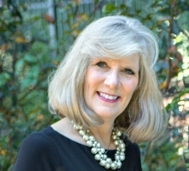 Let's go shopping for Charlotte NC homes for sale! 4310 Cochran Farm Lane Charlotte NC JUST LISTED!